This dinner came together quick, perfect for a weeknight. A crowd pleaser that has the option for lots of short cuts to make it come together even faster. Also lots of additions can be made to suit your own tastes, endless possibilities. Having one person in the house on a strict diet can sometimes make the task of cooking dinner to please everyone a little more daunting. This dinner has a great keto option, that also happens to be a huge time saver, win, win! 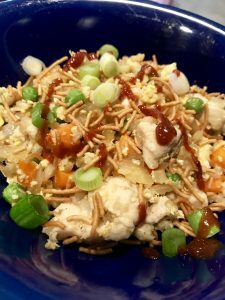 A good fried rice recipe is a nice staple to have in your meal rotation and the addition of chicken gives it enough substance to stand on its own as a dinner. In a large, deep skillet or wok heat 1 tablespoon sesame oil over medium heat. Sprinkle cubed chicken with salt and pepper and cook through once oil is hot. Set chicken aside on a glass plate to keep warm. Returning to your pan, heat remaining 1 tablespoon of sesame oil over medium heat, add ginger, onion, garlic and frozen vegetables. Cook until onions are translucent and frozen veggies are soft, around 5 minutes. Move your vegetable mixture to the outskirts of your pan to create a hole in the middle. Whisk together your 2 eggs and pour into the open hole you made in the pan. Move the eggs around to scramble, once done stir into your veggies. Add your cooked rice, chicken and soy sauce to the pan and stir to combine everything all together. Once plated, add scallions, crunchy noodles and sriracha to your liking. The differences are pretty hard to spot, this first picture is the Chicken fried rice using rice. 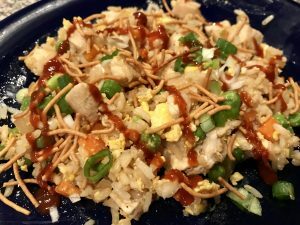 This second photo is the Chicken fried keto rice, using cauliflower rice. Now let’s talk about these short cuts, weeknight cooking for me is based on 2 things.. Menu planning and short cuts! You can absolutely use rotisserie chicken in this and save the step of cutting, seasoning and cooking raw chicken. 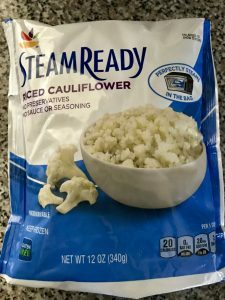 That’ll save time and dishes ✔✔ Next short cut, leftover or frozen rice, the frozen steamer bags of rice you get right next to the frozen vegetables at the grocery store. I’ve bragged about these before, but fully cooked rice done in 4 minutes in the microwave is worth another mention! Also the frozen rice was on sale at our local grocery store for $1 this week, saving time and money! Using a frozen cauliflower rice will make this dinner keto friendly, 2 cups of the frozen cauliflower rice only has 4 net carbs! You can microwave the rice or cauliflower rice and it’ll be done in less than the time it takes your vegetables soften. ✔ Another short cut, if meat isn’t your thing, you can add tofu in place of the chicken, or double the eggs to make it heartier. ✔ My tip for this one is if you like a creamier rice, add in a 1/4 cup of chicken broth when you add in the rice, soy and chicken. This is especially helpful to re-hydrate your rice a bit if you are using leftover or frozen. It will also deglaze the bottom of your pan a bit so you get the most flavor you can from this dinner! 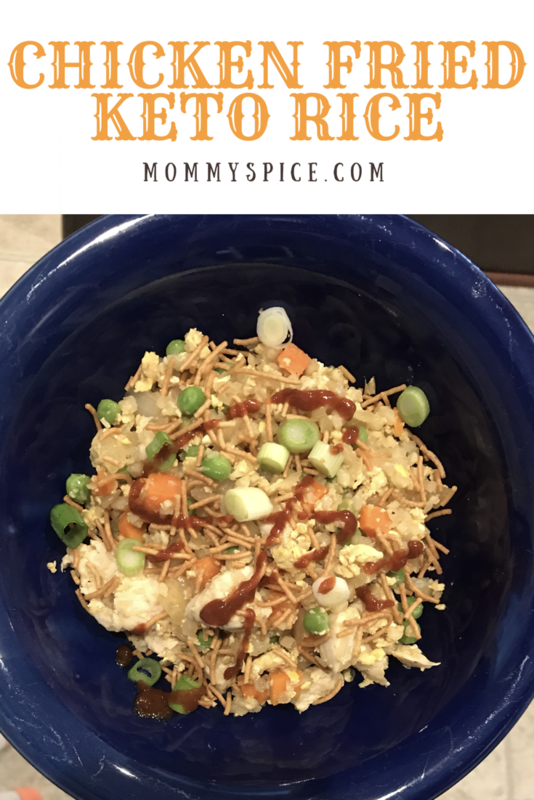 ￼My kids and I cannot even tell the difference when I use the cauliflower rice, the textures and flavors remain the exact same and its a lot healthier!